Behold the new logo for this year's English Language Society! 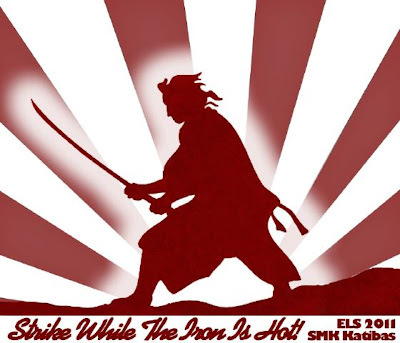 Building on the success of last year's English Language Society, the ELS continues into this year... with some changes & improvements, of course. Last year, I personally oversaw every aspect of the society because it was a personal experiment to see how far I could go with the students. Thankfully, I had the support of the society members, the teachers & the school head. The society was able to made a big impact in the school. This year, I've divided up the work between the English Language Panel teachers to lighten my load because I wanted to dedicate more time into my role as the Chief Warden. However, as time went by, it seems that students are sometimes more reliable than adults. I had to help the teachers more often that desired. Somewhat against my beliefs in leadership but I might have to start managing people very soon. Also, I've decided that all ELS Presidents from hence forth will be picked by the teachers. We had a President this year who was voted in by the students. He was mostly absent & did not contribute much. Over time, I found that the members were reluctant to follow or listen to him which leads me to believe that they might have chosen mindlessly or maliciously. (Kinda like the way their parents choose politicians but that's a story for another day.) After half a year, I stepped in & made a change. It's been better ever since. A month ago, we spiced up the English Language noticeboard with all that jass (will post up pictures on another day) & are currently working on our very own ELS HQ (an unused room at school given to the ELS)! You know me... when I'm done with it, it'll be all flashy with fancy deco & lights! Our single most significant event of the year, the English Language Week & English Language Night will be held in September. Planning is complete & every teacher has selected an activity to run. Some of the more interesting add-ons are "Gee" by Girl Generation will be performed this year & there will be a voluntary sing-a-long every night conducted by myself + powerpoint + a talented student guitarist. I originally wanted to include a RockBand 3 performance but I have had difficulty procuring the said game. Will share more as time goes by. So, what is your English Language Club/Society at your school doing this year?